Generation to generation medium-firm massage treatment uses Balinese long stroke, skin rolling, kneading, and reflexology techniques to stimulate blood circulation and soothe aching muscles using relax massage oil. 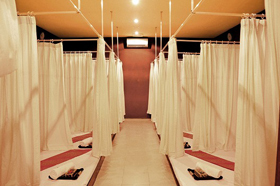 The massage will increases your blood and lymphatic circulation with deep level of relaxation, help to relieve stress and help to create a feeling well-being. Combine massage is signature that two therapists working in synchronize harmony. 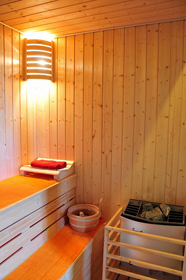 The therapeutic and relaxing treatment is designed to stiffness and soreness, and restores energy and balance. Smooth, warmer rocks glide across your body in a long following stroke to help the muscle relax and has a soothing effect on your emotion. The ancient, healing, pressure point massage technique to stimulate the body’s natural healing capabilities and reduces accumulated toxin. Massage Oil with luxury natural aroma brings draining and firming properties to refine problem areas. Exceptionally effective natural ingredients work in synergy to activate slimming and anti-cellulite process while bringing absolute pleasure and relaxation to your body. This is a stretching techniques and deep tissue pressure point massage. Using no oil to release tension, rejuvenating, increase vitality and flexibility and create wholeness of body mind and spirit. It helps to release toxins and stimulate blood flow. The treatment uses paste that cleans and exfoliates the skin to soften and cleansing to hydrate the skin and leave skin soft, glow and beautify. Rich Vitamin C may lower the risk of cancers of the gastrointestinal tract. Enjoy a powerful blast of caffeine, a potent free radical scavenger and cell detoxifier, with this aromatic blend of Bali Coffee beans and rich coffee absolute to smoothes skin. Antioxidants, promote increased blood circulation, open and cleanse pores, remove dry itch and flakiness, and nourish and moisturize you skin. Green tea provides powerful anti-oxidant properties, giving skin a youthful glow. Helps seal in moisture, leaving your body smooth and silky. Aantiseptic owing , provides a cooling and refreshing effect and rejuvenates face skin. 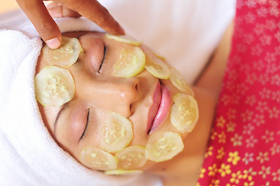 This relaxing facial incorporates pressure point massage to encourage lymphatic drainage with fresh ingredients. This treatment benefit is deep cleansing, exfoliating, detoxifying, skin balancing, and leaves skin soft and clean. Eucalyptus honey is a good antiseptic owing to its germicidal properties, provides a cooling and refreshing effect and rejuvenates those who are suffering from stress and mental disorders. Its cooling effect it can be termed as a magic wand for all your skin problems, the cleaning and cleansing property helps your skin tremendously making it soft and supple. Anti-oxidants, Cleanses and revitalizes the skin, Heals Sunburn, Heals Wounds and Sores. Egg whites can absolutely give your skin a firming sensation, but that’s due to the chemical properties of the egg white - not a miracle treatment. Essentially a deep conditioning herbal hair and the scalp massage. Included relaxing head, neck, shoulder, and hand massage to relieve tension and stress and improve soft, healthy, and lustrous hair. It strengthens the hair and prevents hair loss and besides giving shines your hair. Beneficial carrot will help hair-growth and keep healthy head scalp. Nutrition Ginseng hair cream will increase root hairs keep health, dandruffs and baldness. 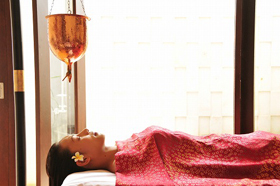 The oil flow treatment to clear the mind and encourage deep relaxation. It begins relaxing Ayurvedic pressure point. A gentle of aromatic oil is poured to an uplifting, inspiring, and profoundly relaxing experience. 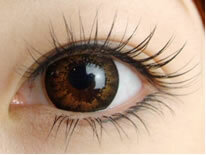 Eyelash Extensions is an exciting new procedure that accentuates the beauty of your client's eyes. A semi-permanent procedure, where the professional adheres an individual synthetic lash to each individual lash of the eye. The result is a natural extension to the client's lashes that will last the full length of the natural lash cycle.